What do you think when you smell a pleasing beauty product? I seem to assume that if it smells nice, it must work, right? Wrong! There are a lot of them out there that yes, they smell nice, but belong in the trash. Here’s our last installment of products that not only perform up to par but also smell heavenly. Create a sense of well being in the bath with a few products from New Zealand’s LINDEN LEAVES. Their Aromatherapy Synergy collection is scented with rose, geranium and ylang ylang. Joyous! 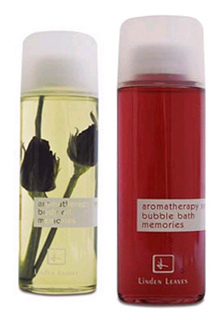 Picks: Bubble Bath ($18.95/9.1oz), Foaming Shower Gel ($13.95/6.7oz), and Memories Body Oil ($29.95/8.4oz). From this collection and the others we have tried over the years, this line never disappoints. All @ lindenleaves.com.